The idea of a city owned and operated radio station began in 1922 with Grover A. Whalen, New York City's Commissioner for Plant and Structures. Working behind the scenes, Whalen got his radio proposal placed before the City Board of Estimate and on June 2nd of that year and they approved $50,000 for the establishment of a "Municipal Wireless Broadcasting Station." Getting on the air took two more years and a few hurdles to jump in the process. For one, transmitters were not readily available. After some searching Whalen found a second-hand one in Brazil that had been used for that country's Centennial celebration. 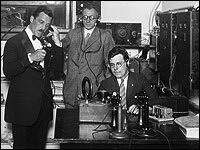 They shipped it north and on July 8th, 1924, WNYC began broadcasting at 570 AM. In battle with other stations and the FCC, the frequency shifted over the years to 810 AM, 830 AM and finally to its present location at 820 AM. The WNYC microphones were present when Admiral Byrd returned from his historic flight over the North Pole in 1926 and when Col. Charles Lindbergh returned from his solo flight to Paris the following year. The linguist V. Harrison Berlitz held several different language classes on the air and the later famous NBC and CBS news commentator H. V. Kaltenborn pioneered radio's first quiz program, The Brooklyn Daily Eagle's, "The Current Events Bee" on WNYC in 1926. 1929 saw the beginning of the Masterwork Hour which went on to become "radio's oldest recorded program of fine music." In 1934, Mayor Fiorello H. La Guardia seriously considered shutting down WNYC but appointed a citizen's committee to consider all the options. The committee, including CBS chief William Paley, recommended WNYC stay on the air with some reforms. Later, the Mayor made great use of the station every Sunday in his Talk to the People program. In 1937, the transmitter was moved from the Municipal Building to a new WPA underwritten facility on the East River in Greenpoint, Brooklyn. In 1938, the Municipal Broadcasting System was launched and its head, Morris Novik, reported directly to the Mayor. Under Novik's leadership the WNYC became a model public broadcaster starting, among many landmark programs, the American Music Festival. On December 7th, 1941, WNYC was the first U.S. radio station to announce the Japanese attack at Pearl Harbor. The station added an FM antenna and transmitter on top of the Municipal Building and on March 13, 1943 began full operation on the "static-less" FM band. During the WWII and into the 1950s, WNYC was the city's primary clearing house for civil defense information. During the newspaper deliverymen's strike in July 1945, Mayor La Guardia instituted The Comic Parade, a daily reading of the funny papers in which he took part on two occasions. Following the war, WNYC provided regular coverage of United Nations sessions as well as civic, cultural and news events around the city. It also expanded its child-oriented programming while continuing to be a leader in classical and American music programming. In March 1995, Mayor Rudolph Giuliani agreed to sell WNYC AM and FM to the WNYC Foundation for $20 million. On January 7, 1997 the City transferred ownership of the licenses to the WNYC Foundation and on March 11, 1997, the licenses were assigned by the Foundation to WNYC Radio. The station strives to continue a legacy of innovative programs under the distinguished leadership of President and CEO Laura Walker, the first non-mayoral appointee in WNYC's history. With the launch of wnyc.org in 1998, the station extended its virtual community internationally. The new century ushered in a significant expansion of programming and in the Spring of 2008 the station moved to new quarters on Varick Street including the street level Jerome L. Greene Performance Space. In October 2009 WQXR joined WNYC as part of the New York Public Radio family followed two years later by WNJT FM-Trenton, WNJB FM-Sussex, WNJY FM-Netcong, and WNJO FM-Toms River comprising New Jersey Public Radio and WQXQ in 2013. WNYC Studios were launched in 2015 as a major new multi-million-dollar investment to incubate talent and double down on podcasts. Today, WNYC Radio (93.9 FM and 820 AM) is the most listened-to public radio station in the United States. With extraordinary support from listeners, corporations and foundations WNYC Radio is now independent of city government having paid for its broadcast licenses. WNYC is a member station of National Public Radio (NPR) and Public Radio International (PRI). Since 1940 WNYC and WQXR have been honored with 22 Peabody Awards and citations. WNYC's history of providing innovative and award-winning news, educational, cultural and public affairs programming reflects the enormous diversity and cultural depth of the New York metropolitan area. To learn more about WNYC's rich broadcast legacy go to Archives and Preservation.